Before we get into the details, a quick refresher. This year's draft will be held on December 11. Players become eligible for the major league Rule 5 Draft if they are not added to an organization's 40-man roster after four years if they were signed at age 19 or older, or after five years if they were signed at age 18 or younger. Teams draft in reverse order of the previous season's standings. A team selecting a player must pay $50,000 to the team from which the player was selected, and must keep that player on the 25-man roster for the entirety of the following season, with the player needing to remain active for at least 90 days. If the team chooses not to keep the player on its active roster, it must offer the player back to his original team for $25,000. If the original team declines to take the player back, the selecting team may then choose to waive the player. There are also Triple-A and Double-A portions of the draft. Players eligible to be selected in each round are those who are not on the reserve lists for those levels, which are similar to the major league reserve list. Players selected in these rounds must merely be kept on the appropriate reserve list, not necessarily at that level of the system. For example, the Red Sox selected Jonathan Roof, who split 2014 between High A and Double-A, in the Triple-A portion of the 2013 Rule 5 Draft. The cash payments for selections at these levels are much lower as well. Catcher Blake Swihart (pictured, above) and left-hander Eduardo Rodriguez are the two certainties be added to the roster on Thursday. Swihart is arguably the best catching prospect in baseball and is probably less than a year away from being ready for a full-time gig in the big leagues. Rodriguez set the Eastern League aflame following his trade from Baltimore at the deadline, and is arguably the club's top pitching prospect. Both are close enough to the majors and have developed-enough tools and skills that they could spend a year in the majors if need be. 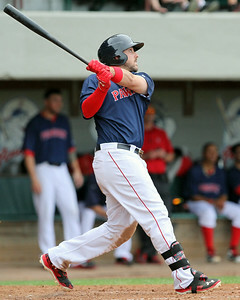 For more on Swihart and Rodriguez, be sure to check out our Top 40 Season in Review entry on each. With the Red Sox currently possessing four open spots on the 40-man roster, infielders Travis Shaw (pictured, right) and Sean Coyle are also likely to be added, the former a bit more so than the latter, but are not certainties like Swihart and Rodriguez. Shaw recovered from a subpar 2013 to rediscover his power stroke, slugging a system-high 21 home runs between Portland and Pawtucket. Coyle similarly recovered from a disappointing 2013 campaign, that due to time missed with injury. 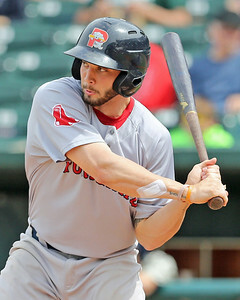 Coyle also showed the ability to put bat to ball with authority in his season with the Double-A Sea Dogs, but questions remain whether he will be able to put bat to ball enough to let said "authority" play up enough to be more than a backup infielder. Again, the entries on Shaw and Coyle in the Top 40 Season in Review are recommended reading. A number of other interesting names comprise the list of unlikely additions to the roster. On the offensive side, outfielder Henry Ramos is the only other potential addition. Although he has an interesting combination of athleticism and improving skills, a stress fracture in his tibia ended his 2014 in May, and he therefore has a level of rust that would make sticking in the majors difficult. He has gotten healthy in time to play in his native Puerto Rico this winter, but is hitting just .180 and still working his way back from his layoff. On the mound, a number of arms with potential big league bullpen futures could potentially be exposed to selection. Right-hander Noe Ramirez combines a deceptive arm angle with a decent changeup, but with a ceiling of little more than a middle-innings arm, will the team use a spot on him now? Fellow righty Miguel Celestino re-signed with the Sox after the season ended rather than testing the minor league free agent waters, but possesses a similar ceiling if he cannot harness his stuff. He went unselected last season, and the only difference this year is that he is a year closer to the majors, a not insignificant point. Right-hander Aaron Kurcz has been hitting the low-to-mid 90s with his fastball after returning from Tommy John, but underwhelmed in the Arizona Fall League, at least statistically. Two members of the Portland rotation, Luis Diaz (pictured, left) and Keith Couch are eligible. Diaz, like Celestino, is eligible for Rule 5 for the second time. He sits in the low 90s with his fastball, but has posted underwhelming strikeout numbers. Couch continued to get results this season, his second in Portland, but his arsenal underwhelms. Without significant time in Triple-A, and following an uninspiring stint in Arizona this fall, Couch is unlikely to be picked. Finally, the last Sea Dog of note is left-hander Robby Scott. The former undrafted free agent posted a sub-2.00 ERA as a stalwart in the Portland bullpen this year. He sits in the high 80s with his fastball, but the potential lower threshold for left-handers would seem not to apply to him given his heavy reverse splits. Lastly, one low-minors wild card entered the picture late this fall, when reports began to circulate that Jason Garcia was sitting in the high 90s and had hit 100. If moved to the bullpen, Garcia could potentially tear through the minors. Although he is just 22 and yet to pitch above Greenville, thanks in large part to 2013 Tommy John surgery, with that kind of live arm, Garcia has an outside chance at being selected by a second division team that could afford to stash him in the back of its bullpen while he learns to harness his suddenly powerful fastball. Given the lack of available talent in the modern Rule 5 draft—see the above-mentioned decrease in selections—an arm like Garcia's might interest other teams. 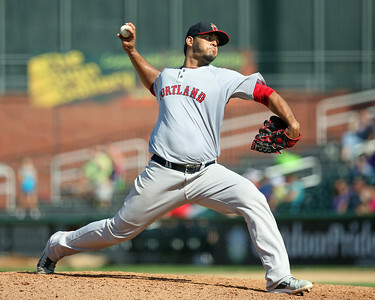 On the other hand, as our friend Alex Speier of WEEI.com put it in our recent interview with him on the SoxProspects.com Podcast, given his ceiling is likely that of a bullpen arm, it is likely not worth it for the Red Sox to protect him at this juncture. Other, even longer shots include right-handers Jonathan Aro and Jacob Dahlstrand, and outfielder Keury De La Cruz. What about the Red Sox? Will they select anyone? To be frank, it is unlikely that they will, or at least anyone they intend to keep. The last time the Red Sox selected someone in Rule 5 that they kept around was 2008, when they selected current Baltimore starter Miguel Gonzalez. In the meantime, the club has made selections for other teams, selecting Jeff Kobernus in 2012 and trading him to the Tigers for Justin Henry, and then selecting Marwin Gonzalez in 2011 and trading him to the Astros for Marco Duarte. Even with the sixth pick, the latter situation is more likely than the former. However, Boston is slightly more likely to make a selection in the minor league portion, as they have done so in each of the last three years. Even at that, the club is unlikely to make a significant addition. Corrections: Earlier versions of this piece stated that the deadline to set rosters was 5 p.m., and that the Red Sox had five open spots on the 40-man instead of four. It also incorrectly listed the Gonzalez-Duarte trade as being made in 2013. Chris will run laps for each mistake.